Fresh rewards have just arrived on the European My Nintendo site, and if you're still rocking your 3DS and Wii U you are in luck. Unfortunately there are no Nintendo Switch reward offerings, but these are all lovely games and well worth splashing those gold coins on. What will you be picking up? AT LAST!!! GOOD REWARDS!!! Well it would be if i didn't already have them. Doesn't seem like a good list, except for runners I guess. Here's hoping Art of Balance becomes available on the North American My Nintendo. I'm looking for any excuse to spend my gold points before they expire, and just about every offer so far has been a game I already own. I have the 3DS version of that game, but I wouldn't mind getting the Wii U version for free. Finally. Unfortunately I caved in and spent my coins on that swap note stuff a week or two ago. I was sure they weren't going to upload anything before my coins expired. Meh. I'll get the pinball game if it's still there when my next batch of coins is set to disappear. I think my points just expired. I won't miss them. @Mario_Fart Points do not expire until the end of the month. I wish the Pokemon games on mobile were Nintendo mobile games because then I could spend my silver coins on Pokemon Duel. Art of Balance is awesome, but anyone interested has probably had it for years... same for Runner 2, which I essentially got for free as part of the Nindie Humble Bundle years ago... Zen Pinball is just not good on 3DS (great on home consoles)... never heard of the other one. And besides... I'm assuming my points have expired (which is BS) and I'm not planning to login to check. I've had more points (gold and platinum) expire than I've been able to spend. I miss the old program. I just wish everything I wanted on there would stop needing gold coins. I know it makes sense because you can only get gold coins by actually spending money and I have gotten all of my platinum coins without spending a dime, but it's still a little annoying because I am going to run out of gold coins soon but have over 10,000 platinum just sitting there. Have 140 Gold coins expiring at the end of the month. Saw this article, literally couldn't have been happier. Realised I own all the games on offer here, once again felt the need for Switch rewards. Sigh! I have 1200 gold coins that need spending. I want to be able to spend them on Switch VC titles. I know... I know... I can always hope. Art of Balance is a good one. If you don't have runner2, get Runner2. Art of Balance is an absolutely wonderful game, really good for parties and well worth a few coins. More full games, even if smaller-scale, on offer? It's been a while indeed. Don't mind if I do! these are some good rewards if you don't have the games yet. runner 2 and art of balance are both amazing! Finally, now this just needs to come stateside. @Kalmaro art of balance is very good. It's made by the fast racing neo guys. I have Runner 2 and Art of Balance already so I downloaded both of the 3DS games. I tried Zen Pinball on Wii U back when it was first released but didn't feel the need to get it. Might as well get it now before my coins expire. I know nothing of the squirrel game. I'm getting them all as I have 850 points rotting away! @Late Just finished Super Acorns last night then these offers come up lol. Its an okay game if you like platformers. Some time trials and rewards, and a Turbo mode which might be tricky. Zen pinball and Runner 2 especially are really good. Already have them all but its a good idea to start doing them. Hope the next batch will have some I don't have . It's still pants. Costs a small fortune in Gold Points. Think how much you've to spend to get these cheap games. I guess you can say it's better than nothing but I've had about 100 Gold Points expire on me so far with more due to expire in a week. Finally got Runner 2. Seems like a solid game! I like that they are starting to offer full games for coinsand I hope this comes to NA before my coins expire. I do wish though that the discounts could stack. If you want you could get 30% off but you should also be able to get 60%, 90%, or 100% off if you have the coins. @Bunkerneath I wouldn't be surprised if, like the 30% discounts, they might tie it right to your account, so you can't sell the code. I was going to get a resell a code for 30% off to get SOMETHING for my Gold coins, but luckily, I tried it with some silver ones first for a game I actually wanted to buy for myself, and there was no code involved. Maybe even way too late, but I'm glad to FINALLY see this happening. There's hope for this to come to North America and the Switch at some point! Useful rewards! Finally! so is the USA going get good ones now or is it going be dumb discount no one cares about? @MarioPhD It's not the first time they have had games on mynintendo, and last time I purchased Mario64 on my mynintendo and gave the code to my daughter because I already had it on wiiU and she didn't. Think the discounts work differently. Cool, hopefully NA will get the same. Where are the Switch rewards? When are they gonna come? Shouts NINTENDOOOOOOOO WHAT ARE YOU DOING!!!??? Finally some great rewards! Picked up Art of Balance and Runner 2. Real glad to see them still throwing out some treats for Wii U and 3DS, especially the former. I'll be interested when this starts in North America. Okay cool, the selection of games is still poor but at least we're getting closer to a modern idea of "reward system" that isn't a total rip-off. It only took a couple of years to get to this point. Here's hoping by 2020 Nintendo will start to give their customers games they actually want to play. A good step but I have them all already. I have 3 of the 4 games, and zen pinball doesn't interest me. @Ryu_Niiyama I hope so. I've got 80 gold coins that are going to expire by the end of the month, and there's really nothing that interests me for the NA site. A slight improvement, yay! Make this available in NA. @Joeynator3000: Here's to hoping NA changes their pattern as well, but I'm not holding my breath. Hopefully they will someday include Nintendo Switch games with this feature too! I hardly play my Nintendo 3DS anymore and my Wii U is at my brother's house so there isn't much for me, despite the fact these are some good games. no mynintendo had quite a few games early on. Super Mario 64 was available for 90 coins. 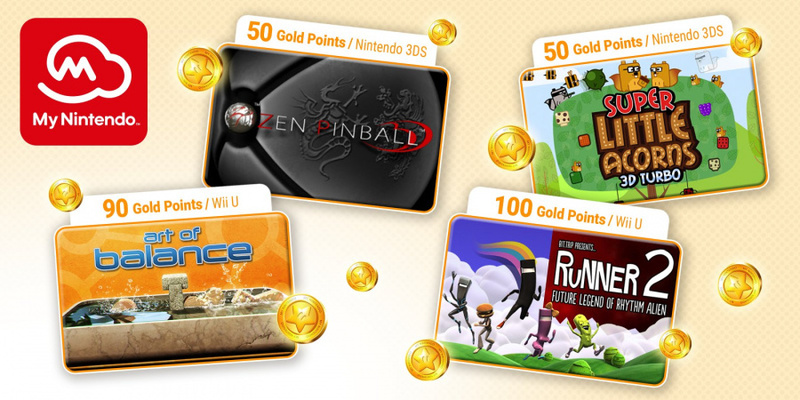 warioware and Zelda picross needed platinum coins whereas the rest used gold coins. Good, getting better. Hopefully we get the same thing in NA too, especially before the month ends. About time that we get "free" games with the gold coins and not mainly discounts and to a lesser extent dlc. Woah woah WOAH...My Nintendo is slowly getting up to par with Club Nintnedo. Now bring this to NA. Wait... actual full games?!? This is unbelievable; maybe hope is not lost. Im bleeding gold coins like crazy. At one time i was sittng at almost 1k gold coins, im now down to less than 300. Ill be down to 0 by the time Switch rewards roll in. This new My Nintendo thing has been a disaster since it came out. Nintendo never learns. Picked up Zen Pinball since I had 80 coins I'd otherwise have never used. Not sure if I'll ever get the chance to play it but, I shan't complain about free stuff!